Highlight 2016: selected as one of the highlights of the articles published in Journal of Physics D: Applied Physics (J. Phys. D) in 2016. Article chosen to highlight some of the excellent research and reviews published in Journal of Physics D: Applied Physics in 2016. The articles were selected for the high praise received from referees, presentation of outstanding research and popularity with our online readership. . For 2016 60 articles were chosen. Highlight 2007: selected as one of the highlights of the articles published in Journal of Physics D: Applied Physics (J. Phys. D) in 2007. 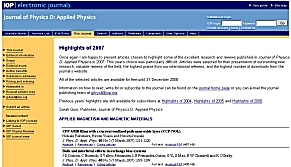 Article chosen to highlight some of the excellent research and reviews published in Journal of Physics D: Applied Physics in 2007. Articles were selected for their presentation of outstanding new research, valuable reviews of the field, the highest praise from our international referees, and the highest number of downloads from the journal's website. For 2007 30 articles were chosen. 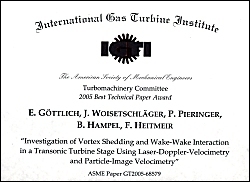 E. Bertolini, P. Pieringer, J.Woisetschläger, W.Sanz (2018) Prediction of Transistion Noise in a Turbine Cascade Using LES, 12th International ERCOFTAC Symposium on Engineering Turbulence Modelling and Measurements - Montpellier, France, 26 Sep - 28 Sep 2018. J. Gürtler, F. Greiffenhagen, J. Peterleithner, J. Woisetschläger, D. Haufe, A. Fischer, J. Czarske (2016) Seedinglose Messung der Wärmefreisetzungsrate und Geschwindigkeit in drall-stabilisierten Flammen, Lasermethoden in der Strömungsmesstechnik - 24. Fachtagung, Cottbus, 6. - 8. September 2016, Number 7 (8 S.).